Wetland mitigation banking is a growing industry in the US but its complexities run deep and as of right now, it lacks a proper analysis evaluating the risk facing both bankers and regulators. But two industry analysts are making progress with a paper offering guidance on market risks. Here is a brief summary of the 22 risks the authors discuss. 23 January 2014 | Wetland mitigation banking is the largest ecosystem services market in the US. But that doesn’t mean the market has reached full maturity or that it comes without risk. A study released last month entitled Navigating Wetland Mitigation Markets: A Study of Risks Facing Entrepreneurs and Regulators, says the market lacks transparency as well as efficiency and is relatively unknown to investors. The paper, written by Patrick W. Hook and Spenser T. Shadle, two recent joint-degree graduates of Yale’s School of Forestry and Environmental Studies and School of Management, is meant to be a comprehensive reference for newcomers to the mitigation scene from the business and finance sector as well as for regulators. It draws out the most critical risks separate participants face and offers strategies to manage this risk when possible. The study is based on existing writings on this subject as well as interviews with industry participants on the most significant risks. The creation of the Clean Water Act (CWA) in 1972 not only helped curb the ongoing pollution of US’ waterways, but it also established the significance of wetlands to local and national economies. And as time went on, amendments were passed that continued to solidify their importance. Section 404 of the CWA puts the US Army Corp of Engineers (Corps) in charge of monitoring dredging and filling activities. Then the government adopted a ‘no net loss’ of wetlands policy. With these federal regulations came an ecosystem services market based around mitigating wetland loss. Fulfilling wetland compensatory mitigation requirements can be done using three options. They are Permittee-Responsible Mitigation (PRM), In-lieu Fees (ILF) and wetland mitigation banking. For the banking option, the bank restores, enhances, creates or preserves an area of wetland which generates credits. Developers offset their negative impacts on wetlands by purchasing credits from a wetland bank. The paper discusses different types of risk and divides them into two categories: those faced by entrepreneurs/investors and those faced by regulators. 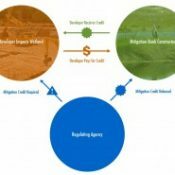 Requirement of large initial capital outlay-the complex entitlement process (locating, certifying and managing) of a mitigation bank is expensive and requires a lot of capital. Loss of key people– because there are few large organizations within the industry and the positions are often specific, losing “key people,” technical experts, managers and executives, is an especially significant loss. Difficulties deploying committed capital – it can be challenging for entrepreneurs to meet criteria for an increase in a mitigation banking investment and then there is the risk that they won’t deliver on expected results because locating suitable banking property is difficult. Supply of credits delayed or reduced-this prolongs the entitlement process and could be the greatest risk for entrepreneurs especially if the reasons for delay are out of their control. Demand for credits delayed or reduced-An inefficient and slow permitting process-which permits developers by requiring compensatory mitigation- will affect credit sales schedules and thus a bank’s rate of return. 2008 rule applied unevenly – Industry participants argue the Rule isn’t enforced evenly causing different interpretations to affect supply and demand and can be disadvantageous for mitigation banking in some areas. Rules change on what must be offset Changing CWA and mitigation regulation can influence credit demand and thus poses as a risk to entrepreneurs. Deviation from forecasted credit prices– Accurately determining credit price is difficult and forecasting the price is near impossible without the added challenge of being the first in the market where there are no existing credit prices to base an estimate. Quantity risk: not able to sell all credits or not able to sell on projected schedule– Even if bankers receive their credits on time, there is still the risk they won’t sell all of their inventory. Forced to sell credits at wrong time-Bankers are forced to sell credits at a disadvantageous time when prices are lower than they would be at a later time because of an immediate need for cash to keep the bank functioning or for other reasons. Entrepreneur does not realize a terminal value upon sale of property-Bankers calculate a terminal value (the selling price for the property) and then fail to find a buyer once all the credits have been sold which hampers future use of the property and is made worse for bankers because there is no long-term financial management of the land. Hydrological/biological processes do not perform as planned-Because of the complexities involved in wetland mitigation banking, the banks don’t always perform as planned. Design or construction errors-Engineering, planting and other aspects in the implementation or design phase could cause the bank to fail. Project Management Failure-If entrepreneurs don’t meet the requirements for a certain project because of a lack of understanding or other reasons, they risk unplanned expenses and scheduling conflicts. Damage to site from natural disasters– Wetland banks are vulnerable to extreme weather and although these events won’t affect the entitlement of the bank, they can cause significant delays. For regulator risk, the paper lists four types. Inadequate endowment or site protection mechanism for long-term maintenance of site-Without an adequate site protection mechanism that ensures long-term care of the bank site is one of the greatest risks the Corps face because without it the site may degrade. Conflicting easement on property-Existing easements, liens or other interests can encumber the process and conflict with the conservation easement necessary to create a mitigation bank. Temporal loss of wetlands– Temporal loss is a threat to the Corps’ ‘no-net loss’ policy on wetlands and, while banking seeks to eliminate this type of loss, it’s still a factor because the market relies on advanced credits that don’t provide mitigation ahead of development impacts. Compensation at the expense of avoidance and minimization-In the mitigation process, developers must first prove they have avoided and minimized an impact to the best of their ability, but with the growth of mitigation banking, the concern that the Corps has become relaxed on these prerequisites has grown as well. The paper then discusses the risks facing both the regulator and the entrepreneur. There were three risks they associated with both. Geographic service area changes, or is not spatially appropriate-For regulators, there is the risk that regional offices won’t properly balance ecological and economical considerations which threatens the integrity of the industry as well as financial soundness. Any alterations the Corps makes to the banking property, such as alters the size, after arrangements have been agreed on can critically impact the banker. Competitors do not play by the same rules-Bad-acting entrepreneurs can build inferior banks at a lower cost damaging both the long-term ecological health of the wetlands and the industry’s reputation. When regulators lower requirement standards, the quality of banks is lowered also. Reputation hurt by selling credits to unpopular development-Both the Corps and bankers-by either requiring forms of mitigation or selling credits- could damage their reputation by engaging in the mitigation process with unpopular development activities like fuel pipelines. Hook and Shadle’s paper goes on to suggest ways to manage and minimize risk that can’t be avoided. For instance, choosing a bank site in a district that favors the industry is a smart decision as is developing relationships with regulators. This will ensure the regulator is acting in the banker’s best interest and help control possible risks. The paper also mentions building financial models for valuing risk. In conclusion, the authors note the need for a more formal analysis on how entrepreneurs and investors should manage the banking industry’s risk especially when considering private sector involvement. The private sector will want to know the price of risk. But incomplete and low quality data has hindered past evaluations of mitigation banking, the authors say. Once the wetland mitigation market has developed successful methods to understand, manage and value their risk, the authors say, those best practices could be applied to other emerging ecosystem services markets like nutrient trading and conservation banking. Kelli Barrett is a freelance writer and an editorial assistant for Ecosystem Marketplace. She can be reached at kbarrett@ecosystemmarketplace.com.